Paul McCartney is a former Beatle and one of the most famous and well-loved performers of all time. Paul met John Lennon in 1957 and the two quickly connected. Paul joined John's band the Quarrymen and the two quickly began restructuring and renaming the band until The Beatles were formed. George Harrison, Stuart Sutcliffe, and Pete Best were part of the band's first members. However, Sutcliffe left the band and Ringo Starr eventually replaced Pete Best. It was after this change, that the group began their wild and crazy rise to international fame. 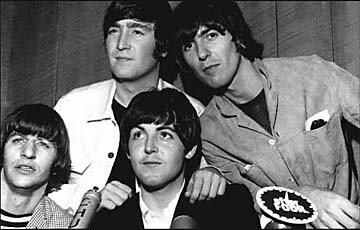 Soon after, Beatlemania took over the world and their songs provided a soundtrack for an entire generation. 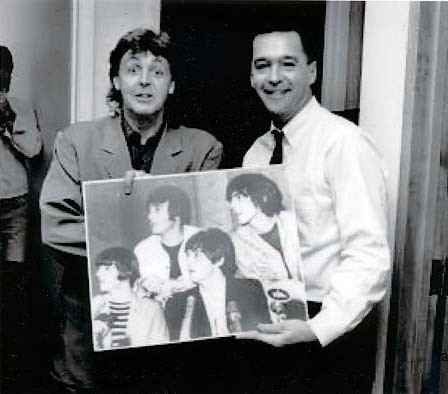 Below, Paul is pictured with a young John Rowlands and a print of a photo from the same shoot as the cover photo of Rock & Rowlands Flashback.